Wholesale white hand towels(86/14 cot/poly blend) for use in Salons, Gyms, Spas, Hotels and many more businesses. If you are looking for a medium size hand towel this will be the product to go with. Salons are places of style and sophistication. Often, they set the mood for an enjoyable experience with light music, natural décor and gorgeous photos of previous haircuts or manicures. It’s important to carry that classy vibe through every part of your salon, including with your hand towels. When you use exceptional hand towels, you remind people why they’re paying to have their hair done at this particular salon. 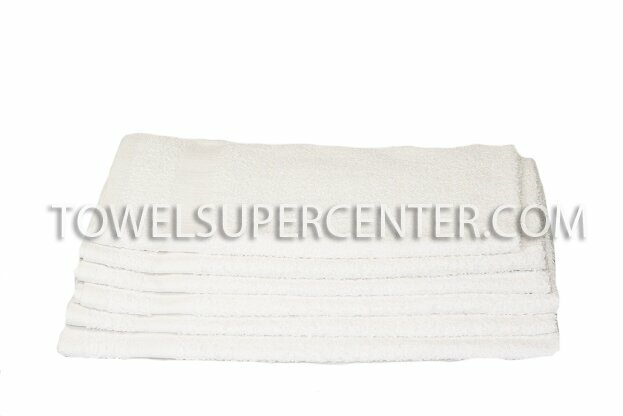 Why choose Towel Super Center for your salon hand towel needs? Our towels have unique qualities, such as their extra absorbency. There’s nothing more frustrating than a towel that doesn’t hold water. Ours not only absorb, but they also dry out quickly. That means they won’t develop a funky smell after going through the wash, either. We also offer low pricing on our selection of hand towels. We sell them by the dozen, and when you buy more than 12, we’ll give you a discount. That saves your company money and also the time you would have spent having to replace towels down the road, because you stocked up. Contact us to receive information about our premium hand towels and how they can help enhance your business.